Cold, wet, and gray as it gets in January, city of Berlin hosted the first Bodhicharya winter retreat very well. First wave of confusion was overcome easily as registration went on smoothly and retreatants settled in cosy future cafeteria of great Berlin Bodhicharya center. Warmly greeting each other we kept our best face for Rinpoche who, due to sore throat and loss of voice did not show up for the first teaching. Well, things happened, don't they? Over the next few days we received what I humbly consider as complete Buddha's teaching, in simple, direct, and precise way. It started with preliminaries and it ended with deathlessness. Rinpoche covered it all in three and a half days. It is difficult to say how much of it we could conceive, but there is no slightest doubt that he gave it all out. He kept nothing for himself. An ultimate gift of love, said someone who received similar teachings years ago on different continent. People who hold the Berlin center are hard workers, fully dedicated to assisting Rinpoche in every task he performs. Always on time, precise, and most of all kind, they run this retreat as smooth as possible. Meals were tasty and yet easy to digest, as retreat meals should be. Dishes were carried in and out, full or empty, nothing got broken. Toilets were always clean, and there were these pretty blue vases, feng shui, I guess. Even the gift shop was always open, in case someone felt like offering gift to themselves or to someone else. It seems that everybody was doing everything, and yet in harmony. Maybe it has to do with what is commonly referred to as traditional German discipline, but I think it takes more than that. Perhaps, an insight that it is meaningful to do things in good way, to assist our teacher properly, and most of all, to know that all of this is Dharma practice as Rinpoche teaches. The center itself, half finished or half unfinished, depending on how optimistic one is, is a story on its own. It is huge indeed, and yet, easily observable in sense of unity. 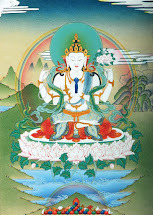 There is a main gompa as it should be, then, everything else is working it's way around it. Hallways, lamas rooms, balconies, future organic gardens, who knows what else. The big part of this project is a hospice center with people who work as volunteers with terminal patients and their families. This is to embody Rinpoche's teaching on Dharma practice in social action. To conclude, just to say that every part of my experience with this retreat was inspiration to be more useful and active part of Rinpoche's vast mandala of teaching, practice, and activity. The next Bodhicharya winter retreat is going to happen around the same time as this one. Dates are to be announced soon.